Basically vinyl window frames are made of polyvinyl chloride (PVC). It has been enhanced with specific additives to make it strong, more durable, and a better insulator. Each manufacturer has their own unique “recipe” with plasticizers, pigments, and other chemicals. How do they hold up in extreme temperatures? Vinyl does very well in both hot and cold temperatures. Because it is a plastic, the material does not naturally transfer heat. The material will not warp, discolor, fade, or crack does to temperature fluctuation. What styles do vinyl windows come in? How do I maintain vinyl windows? Good news! Vinyl windows require very little maintenance. In fact, with a little routine washing, these windows will continue to look like new—no sanding and re-painting required. Design Pressure (DP) is a rating that identifies the load – induced by wind and/or static snow – that a product is rated to withstand in its end-use application. So basically, DP is a performance specification for how strong a window is, expressed in how many pounds per square foot (psf) of pressure the window can withstand. This specification can fluctuate based on several factors, such as geographic location, the height of the building, the location of the window in relationship to the building, etc. All of these factors are used to calculate what the Design Pressure (DP) is for a specific window or door. The Design Pressure that you need for the windows in your home will vary. If you reside in a low hurricane area (off the coast) DP35 may be adequate for your home, closer to the coast or houses that need higher protection DP50 may be recommended. Most Moss windows will fall into the DP50 category. Double Hung Window: Both sashes move up and down, both tilt in for easy cleaning. 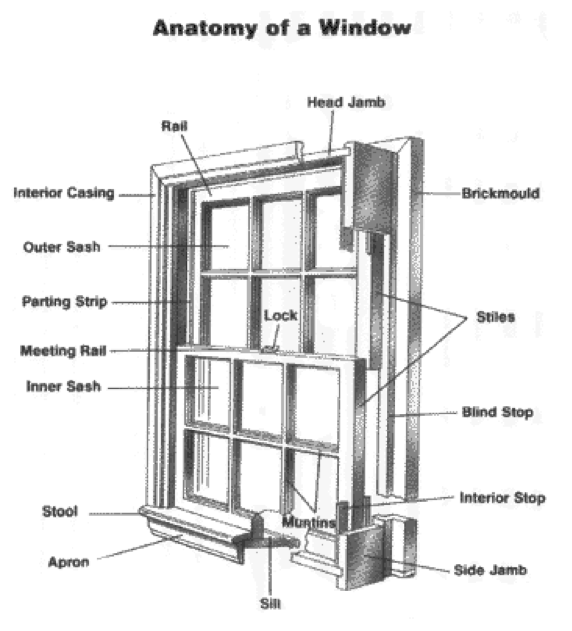 Single Hung Window: A moveable bottom sash with a fixed in place top sash. Awning, hopper, projected window — a window consisting of one or more sash hinged at the top or bottom which project outward or inward from the plane of the frame. An awning rotates about its top hinge(s) and projects outward. A hopper window rotates about its bottom hinge(s) and projects inward. Balance — a mechanical device used in hung windows as a means of counterbalancing the weight of the sash. Brickmold — a molding used as an exterior door or window casing. Casement window — a window consisting of one or more sash hinged to open from the side (adjacent to the jambs), which project outward or inward from the plane of the frame in the vertical plane. Certification — a process that indicates a representative sample of a product line has been tested, that the product meets specified requirements, and that the product is subject to ongoing inspections by an outside certification agency. Condensation — the deposition of moisture (liquid water or frost) on the surface of an object caused by warm, moist air coming into contact with a colder object. Design pressure (DP) — a rating that identifies the load, induced by wind and/or static snow, that a product is rated to withstand in its end-use application. Note: Design pressure (DP) is not to be confused with Performance Grade (PG) or structural test pressure (STP). Loads induced by static snow are applicable only to TDDs, roof windows, and unit skylights. Dual glazing — two layers of glazing material mounted in a common frame and/or sash, separated by a space, and sealed or non-sealed. Fenestration — openings in the building envelope, such as windows, doors, secondary storm products (SSPs) curtain walls, storefronts, roof windows, tubular daylighting devices (TDDs), sloped glazing, and skylights, designed to permit the passage of air, light, or people. Fixed door — one or more non-operable assembled leaves or sliding door panels within a door frame and threshold/sill. Fixed window — a window that is designed to be non-operable and consists of a glazed frame or a non-operating sash within a frame. Note: This category does not include non-operable unit skylights or TDDs, or products fabricated from curtain wall or storefront systems that are used in window openings. Frame — the enclosing structure of a window, door, TDD, roof window, SSP, or unit skylight which fits into or attaches to the wall or roof opening and receives glazing, sash, panels, leaves, or vents. Fully tempered glass — glass that has been heat treated to a high surface and/or edge compression to meet the requirements of ASTM C1048 (kind FT) or CAN/CGSB 12.1. Note: Fully tempered glass, if broken, will fracture into many small pieces (dice) which are more or less cubical. Fully tempered glass is approximately four times stronger than annealed glass of the same thickness when exposed to uniform static pressure loads. Glass — a hard, brittle substance, usually transparent, made by fusing materials such as soda ash (NA2CO3), limestone (CaCO3), and sand under high temperatures. Glazing — (n): an infill material such as glass or plastic. (v): the process of installing an infill material into a prepared opening in windows, doors, TDDs, roof windows, SSPs, or unit skylights. Handle — a component which enables the movement of a sash, leaf, or panel, or which activates a mechanism which locks or unlocks a sash, leaf, or panel. Hardware — all the necessary equipment to retain, operate, and lock or unlock the sash, leaf, or panel within the frame. Head — the horizontal member forming the top of the frame. Horizontal sliding window — a window that consists of one or more sash that slide or roll horizontally within a common frame and can also contain fixed lites/sash. Note: Typically, operating sash are identified with an (X) and fixed lites or fixed sash are identified with an (O). Hung window — a window consisting of vertically sliding sash which utilize counterbalancing devices to allow the sash to be opened to any variable position between its fully open and fully closed limits. See also Vertical sliding window. Note: Common types are single hung, double hung, and triple hung. Inoperable — no longer opening, closing, locking, or unlocking as originally designed. Insulating glass unit (IG unit or IGU) — two or more lites of glass spaced apart and hermetically sealed to form a single unit with an air- or gas-filled space between each lite. Jambs — the upright or vertical members forming the side of the frame. Lite (light) — a pane of glass or an insulating glass (IG) unit used in a window, door, TDD, roof window, SSP, or unit skylight. Frequently spelled "lite” in industry literature to avoid confusion with visible light. Manufacturer — a company which fabricates and/or assembles one or more parts, components, and/or accessories or supplies entire fenestration systems. Meeting rail or check rail — one of the two adjacent horizontal sash members that come together when in the closed position. Meeting stile — one of the two adjacent vertical leaf, sash, or panel members that come together when in the closed position. Integral mullion — a horizontal or vertical member which is bounded at either end or both ends by crossing frame members. Non-operable — intended to not open or close. Operable — intended to be opened and closed. Overall dimensions — the external height and width of the product, expressed in millimeters or inches. Panel — the members of a sliding door or sliding door side lite within a frame which are designed to accommodate the glazing. Rail — a horizontal member of a sash, leaf, or panel. Reinforcement — the material added to individual sash, leaf, panel, or frame members to increase strength and/or stiffness. Sash — the members of a window, secondary storm product, or unit skylight that fit within a frame which are designed to accommodate the glazing. Screen — a product that is used with a window, door, secondary storm product, or unit skylight, consists of a mesh of wire or plastic material used to keep out insects, and is not for providing security or retention of objects or persons from the interior. Sealant — a compound used to fill and seal a joint or opening. Setting block — a device or member that supports the weight of the glazing and is in direct contact with an edge of the glazing after final installation. Side lite — an operable or non-operable product that is designed to be a companion product installed on one or both sides of an operable door or a fixed door. Side lites often have their own separate frame or are contained within the frame of a composite assembly. Single glazing — glazing that is just one layer of glass or other glazing material. Single-hung window — a hung window with only one operable sash. Slider — see Horizontal sliding window. Sliding door — a door that consists of manually operated door panels, one or more of which slide or roll horizontally within a common frame, and can also contain fixed lites/panels. Note: Typically, operating panels are identified with an (X) and fixed lites or fixed panels are identified with an (O). Sound transmission class (STC) — a single-number rating calculated in accordance with ASTM E413, using sound transmission loss values, that provides an estimate of the sound insulation performance of an interior partition in certain common sound insulation problems. Note: The frequency range used is typical of indoor office noises. Spacer — the linear material that separates and maintains the space between the glass surfaces of insulating glass units. Stile — a vertical member of a sash, leaf, or panel. Tempered glass — see Fully tempered glass. Transom — an operable or non-operable product that is designed to be a companion product installed above a fenestration product. Note: Transoms often have their own separate frame or are contained within the frame of a composite unit. Weatherstrip (weatherseal) — a flexible component used to reduce air leakage, water penetration, or both between sash, leaf, panel, and/or frame. Weephole (weep) — an opening that allows water to drain. Welded — when materials are fused by heat to become one when cooled. Window — an operable or non-operable assembly that is installed in an opening within an exterior wall or roof intended to admit light or air to an enclosure, and is usually framed and glazed. Note: Windows are typically designed to accommodate factory fabrication and glazing. For more information and expert help in selecting the window or door that best meets your needs, contact Moss Supply today! Moss Supply Company is a vinyl window and patio door manufacturer. We produce windows and doors for both new construction and replacement applications. © Copyright 2017 Moss Window Supply. All rights reserved. | Mobile-ready websites by WebStation, Inc.